America’s current First Lady knows what it’s like to live under a Communist regime and knows what it’s like to live in fear every day. So, when she visited Warsaw, Poland, she gave a heartfelt speech about safety and security, and refusing to live in fear. Honestly, it’s something everyone in the world needs to hear. 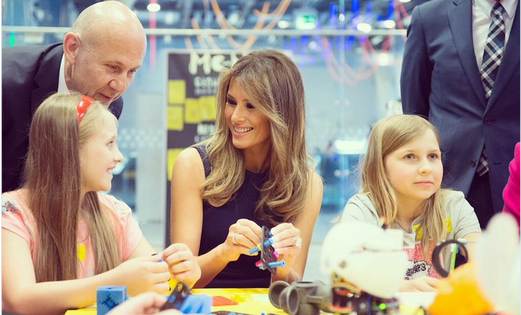 The President and First Lady paid a visit to children at the Copernicus Science Center and Melania introduced President Trump at the Warsaw Uprising Monument, which was dedicated to the thousands who died during the 1944 rebellion that tried to oust the Nazis from Poland. “As many of you know, a main focus of my husband’s presidency is safety and security of the American people,” she said during her speech. The entire transcript can be found right here. In a March speech, our First Lady discussed being raised under Communism and as a result, reveres the safety and freedom of the United States. Something that our fellow countrymen all too often take for granted. You’ve got to love a First Family who actually cares about spreading the message of freedom across the world. Not only that, but Melania doesn’t speak out of her rear when she knows what it’s like to live without. I love it.